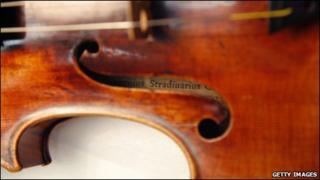 A well-preserved Stradivarius violin has just been sold in an online auction for a record £9.8m. But what is it about the violins made by Italian craftsman Stradivari that makes the instruments so valuable? Over the years, various theories have been touted in a bid to find out why a Stradivarius produces such brilliant sound quality. Antonio Stradivari is considered to be the most distinguished craftsman of the instrument. Born in 1644, he established his workshop in Cremona, Italy, and remained there until his death in 1737. He made over 1,000 violins, violas and violoncellos, and was commissioned by King James II and King Charles III of Spain. It is believed that around 650 of these instruments have survived. His best violins and instruments were made during what is considered his golden period from 1700-1725. His most famous violins include the 1715 Lipinski and the 1716 Messiah. But there is still considerable debate about why the violins made by Stradivari sound superior to modern-day instruments. In 2003, scientists from Columbia and Tennessee universities in the US claimed reduced solar activity in the 17th Century may be the reason for the Stradivarius sound. They said the colder winters and cooler summers at the time produced slower tree growth which in turn led to denser wood with superior acoustical properties - circumstances not repeated since. In 2006, other US researchers said they believed a Stradivarius owed its distinct sound to a chemical treatment designed to kill woodworm and fungi. And it was once argued that Stradivari and others used wood from ancient churches, or that they added a mysterious ingredient to the wood, or used techniques that have since been lost. Some have focused on the type of varnish used on the instruments. But many of today's violin-makers have been unimpressed by such theories, putting the quality down to pure genius on Stradivari's part. The Cambridge Companion to the Violin states that the structure of a Stradivarius is key, noting the flatter shape and the shape of the plates (the panels that make up the front and back of the violin). Ariane Todes, editor of The Strad magazine, concurs. "They don't all sound fantastic but a good one that's been set up properly - the thickening of the wooden plate, the movement of the sound post and bass bar - sounds fantastic," she says. Dr Jon Whiteley, a curator at the Ashmolean Museum in Oxford, which houses the famous Messiah Stradivarius agrees the quality "depends heavily on the shape of the instrument." He explains that Stradivari's challenge was to produce both expressive sound and the volume needed for large concert halls. Prior to the period when Stradivari was honing his craft, violin performances were usually confined to small venues such as private parties and were often used in quartets for chamber music, which did not require a huge sound. "Stradivari came through, he proved a match for the new music being made," says Dr Whiteley. "All his life he was searching for the ideal shape." According to Dr Whiteley, Stradivari experimented with various forms, including a longer model. By the early 18th Century, he had produced a violin that was "not as long but quite large, flatter but not so flat that you lose the resonance that makes the violin so magical". Ms Todes agrees that Stradivari's instruments were "exquisitely crafted, the pinnacle of sound engineering". She says the quality of a Stradivarius is "down to someone who was always trying to do better, he was always getting feedback from players, there was constant self-criticism". However, Dr Whiteley points out that the shape of the soundbox is not as important as the talent of the violinist. "A great violinist like Yehudi Menuhin could make a great sound from an old box and a piece of wire." So how does a musician who plays a Strad feel about it? Paul Barritt is the permanent guest leader with the Halle Orchestra based in Manchester. He uses a Stradivarius which has been on loan to the Halle for the last seven or eight years. Barritt is keen to point out that there are "other wonderful makes like the Guarneri". But he says the Strad is so special because of the clarity of tone. "In a big concert hall, I know the tone will carry. It's not just how loud it is, it's the clarity. "Each Strad is a character of its own, each has a very strong personality that makes them something to deal with, rather like an old house that is very interesting but doesn't always do exactly what you want," he explains. "You have to go with the character of the instrument and then you will get great rewards." He also remarks on Stradivari's impressive skill. "Stradivari was a great workman. The cutting of the inlay is incredible and the beauty is extraordinary," he says. Todes says there is another major reason why we should cherish the Stradivarius. "If you compare it to an old Italian painting, the Strad is an incredible historical artefact that needs to be preserved. It's a work of art."